A ‘head start’ project could save the endangered Houston toad. The event drew an unlikely audience for toad conservation, and therein lay its success. Few Texans know that the Houston toad (Bufo houstonensis) exists, let alone that it’s nearing extinction. Many confuse them with the ever-present Gulf Coast toad, saying, “I have Houston toads in my backyard!” Unfortunately, this breeds apathy while the species needs all the compassion people can muster. The Houston toad disappeared from its namesake city in the 1960s and became the first toad covered by the Endangered Species Act in the 1970s. 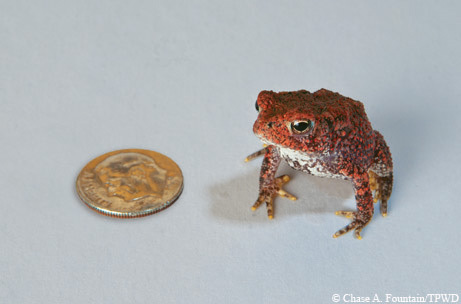 This Texas native was never widely distributed, and today the toads remain only in scattered pockets within East and Central Texas, but primarily in the Lost Pines near Bastrop, a forested region surrounded by post oak savannah, and separated nearly 100 miles from East Texas’ piney woods. If only saving the species were as magically simple as kissing toads. When an endangered species reaches this critical point, biologists often create a safeguard or assurance colony. By bringing animals into captivity, biologists hope to preserve enough genetic diversity that, should the animals reach perilously low numbers in the wild, the captive colony could someday supplement or even re-establish the species. This happened with the red wolf, the whooping crane and myriad other species. And now, Houston toads. They were being pushed beyond their ability to rebound from what Forstner calls a “perfect storm” of threats — habitat loss and fragmentation, fire suppression, invasive chytrid fungus and unnatural predators like cats and fire ants. Houston toads just don’t thrive in human-modified landscapes the way generalist species, like Gulf Coast toads, can. Despite years of conducting research, monitoring their numbers and restoring habitat, scientists saw toad numbers continue to dwindle. “It felt like a twofold, very difficult problem. One, it meant the effort and money and time we had spent trying to prevent this from happening hadn’t worked. Two, we had [decent] toad numbers at the time, but if the drought continued, we were in real trouble,” says Forstner. The move to create a colony proved prescient. After moderate rains in 2007, another intense drought in 2008–2009 caused the Houston toad population to plummet further. “I no longer feel like we were crying wolf,” Forstner says. So with the blessing of the Fish and Wildlife Service, Forstner began collaborating with the Houston Zoo to help the toads by establishing an assurance colony. The “head start” approach they use rescues eggs that might have succumbed to disease or predation in the wild, thus vastly improving survival rates. Such a procedure has helped Kemp’s ridley sea turtles and has rescued American alligators from the brink. Biologist Paul Crump, who oversees the zoo’s Houston toad efforts, shows me their Amphibian Conservation Quarantine Facility. He directs me to dip my shoe soles in Trifectan, a chemical that kills chytrid fungus — an exotic species that has devastated amphibians around the world. Although chytrid is thought to mostly affect tropical amphibians, scientists documented it on several Houston toads. Inside the facility, rows of glass aquariums, complete with sphagnum moss and toads, are stacked three deep. While Crump explains the project, I hear males trilling. It’s nearly breeding season, and frisky males have latched onto females, twice their size at the same ages. The facility has two rooms full of toad terrariums, with another set outside. 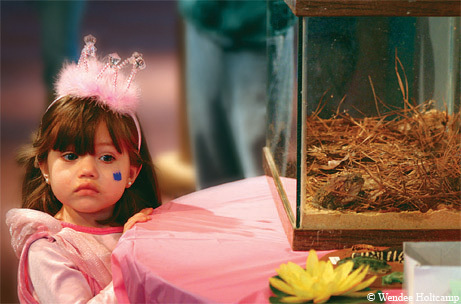 From 2007 through 2010, Forstner, Crump and TPWD biologists began collecting eggs in the wild to bring to the zoo. Each egg strand contains around 6,000 eggs; half were taken and half left in the wild. At the zoo, eggs hatched into tadpoles within 24 to 48 hours, then began their metamorphosis into toadlets 20 to 100 days later. Once the tadpoles sprouted hind legs, they were transferred into a semi-terrestrial setup. Since the program began in 2007, scientists have released more than 5,000 juveniles — in the same ponds they were collected from as eggs — with the vast majority of those released in 2009. They’ve had phenomenal success. More than 50 percent of the 10,000 eggs collected in 2009 survived to become healthy juvenile toads. That’s nearly a thousand-fold increase in survival compared to those in the wild, where less than one-tenth of 1 percent survive for a year. The zoo retained around 400 for its captive assurance colony. Currently, no other zoo in the world houses Houston toads. Despite its critical role, the head start program remains just one piece of a larger effort. Private landowners also play a key role in the toad’s conservation. “Nobody’s shot at me in more than eight years,” Forstner deadpans. I think he’s joking, but he’s not. Forstner says his job involves planning for 100 years from now. In 2008, the Fish and Wildlife Service approved Bastrop County’s Lost Pines Habitat Conservation Plan, which allows the county to grant toad-friendly permits to those wishing to modify land, namely for development. In addition, since November 2008, the county has enrolled more than 1,800 acres into wildlife management programs, which offer tax breaks, explains Roxanne Hernandez, who oversees the plan. Without private landowners, the toads would live only on the nearly 6,000-acre Bastrop State Park. The park plans to reroute some hiking trails to avoid key breeding ponds. Biologists collected egg strands from the park for the head start program, and they released thousands of those same individuals as toadlets there. And after abundant rains in late 2009 and early 2010, it’s shaping up to be a productive year for Houston toad breeding. On any given spring night after rain, when the temperature stays above 50 degrees, Forstner and his toad monitoring team — including Crump — can be found driving the nine counties of the toad’s historical range. TPWD’s Greg Creacy oversees monitoring on state lands, including Bastrop State Park. In the earliest weeks of the breeding season, I join Forstner one evening to monitor toads on the 4,850-acre Boy Scout-owned Griffith League Scout Ranch. We drive and talk, stop for five minutes at “listening posts” to record any frog or toad calling, then drive some more. At a few ponds, we walk around, using flashlights to find toads. Forstner tries to lure them with his own toad trill. Nothing. Most nights, the toad team finishes in the wee morning hours, but especially on breeding nights. Houston toads are “explosive breeders.” Every toad breeds on a handful of nights each year when some unknown elixir of temperature, humidity and season strikes. When that happens, the team captures every toad they can, taking skin samples for genetic analysis and inserting tags so they can monitor individuals year after year. As we drive, Forstner tells me about a “Eureka!” moment. For 10 years he chased that answer. But he was wrong. “The answer turns out to be almost an oxymoron. The reason those ponds are successful is that there are more toads there,” Forstner says. More males trilling allows females to hear from far and away, and as numbers dwindle, their ability to find mates becomes exponentially harder. And what have we done to the landscape? Explosive breeders typically have “toad orgies” at the pond. Males are not discerning, and this causes another problem — interspecies hybridization. Biology class teaches that different species don’t mate, and if they do, they don’t produce viable offspring. It’s not so simple in the real world. Houston toads occasionally mate with both Gulf Coast and Woodhouse’s toads, and their offspring survive to produce toad babies of their own. This can undermine the endangered toad’s genetic integrity and adds yet another complicating factor to recovery efforts. I try but see nothing. Finally, with his more vigorous light-shining, I see it. Quick as lightning, he grabs a Houston toad from its perch just inside the pond edge. The toad is small and cold and wasn’t calling, and we take it back to the truck to record measurements, take pictures and scan it like something at the grocery store, without the beep. “He is an official wild toad,” says Forstner, giddy with our unexpected luck. Tissue samples will reveal whether this toad, probably male, was one of the head start toads. It’s a satisfying project with a measurable impact. As predicted with the heavy rains, the spring of 2010 shaped into a good year for Houston toad breeding. Weeks after I toad-teamed, they started breeding in force. 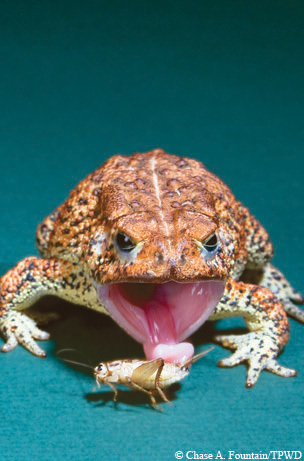 Forstner says more toads called during a chorusing pulse in March than in the past four years, and he believes the egg-and-release program has started to pay off — though he won’t know for sure until genetics confirm the toads’ identities. Either way, it’s a bit of good news for a species that sorely needs it.